The story of my film “Coffee Break” was inspired by real events that happened to me and my co-producer Geoff Bund. Geoff and I first met years ago when working on a film in Russia called “Stalingrad”. We were shooting in a horrible location, 2H from Saint Petersburg, there was mud everywhere, it was dirty and cold and we were working very very long hours. At lunch there was no tables nor chairs so we had to eat our borscht soup while standing in the rain, quite an unforgettable moment. Geoff really likes coffee and he decided one day to make good coffee on set, using the scarce resources we had. “Coffee Break” is directly inspired by this event. I usually like to write fantasy or science fiction and to send my characters in a bigger-than-life journey. For “Coffee Break” however I decided to create characters who were more down to earth but survive thanks to their optimistic vision of life. Grace in the film wants to preserve her memories of happier times and not let her apparent desperate situation overwhelm her. She lives in the present and isn’t slowed down by her past nor terrified by the future. That is a feeling I’m aspiring to. “Coffee Break” was shot for the PGA “Make your Mark” competition meaning it was written, shot and post produced in less than 48 hours. The story didn’t really change during the whole process as we had very little time and resources to make the film happen. Somehow this lack of time to take a step back and rethink the story and the characters was very beneficial I think: The film is more raw and pure than any other film I’ve made. Yes, there are things I would have liked to change if I had more time, but I really like the honesty and simplicity of the film as it is. I grew up influenced by so many visual artists that I wouldn’t be able to name them all! I think the most courageous decision we made was to participate in this “Make your Mark” competition! To write, shoot and post produce a short in less than 48 hours is insane! I barely remember those two days, it’s all blurry, like a dream. I’m not sure I would do it again but at the same time I’m very proud of what we did in such a short amount of time. The bigger risk we faced during the writing / production was the lack of time. Not enough time to polish the script, not enough time to get feedback for anything. We embraced it because we didn’t have a choice… And I’m glad we did! It was a very interesting experiment. 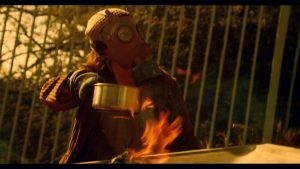 The story of “Coffee Break” can appear cheesy: A woman in a post-apocalyptic world has nothing else to do but to make coffee. But the real story for me is about how important it is to find ways to stay sane and to stay a human being when everything seems to fall apart. Those little things – to sit down and watch the sunset, to close our eyes and listen to the rain, or to make a good cup of coffee – those are the little moments of happiness that are part of who we are and are worth fighting for. The character of Grace in “Coffee Break” wants to remember this feeling and to acknowledge the fact that sharing a cup of coffee with a friend is more important than a passport in a devastated and deserted world. When I’m at the very beginning of a new project, I like to write down why I want to tell this story, what it is about and what’s its essence. Later during the process, I often feel overwhelmed by the compromises I have to make and the changes to the story I have to implement, and when this happen I like to read this first “core” document and make sure I don’t alter anything that really matters to me. It’s so easy to get lost in the process, filmmaking is a long and tedious journey and we often lose sight of why we want to tell this specific story in the first place. Write it down and cherish those words as they are the purest version of your original idea.